Could it be true, spring is actually here? Oh Em G! 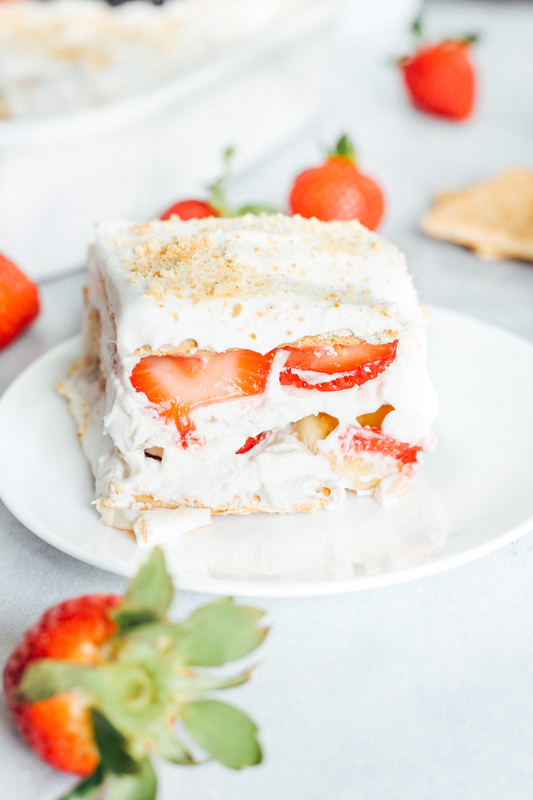 I’m so happy I’m finally able to whip out this Vegan Strawberry Banana Icebox Cake and it’s insanely easy and delicious. 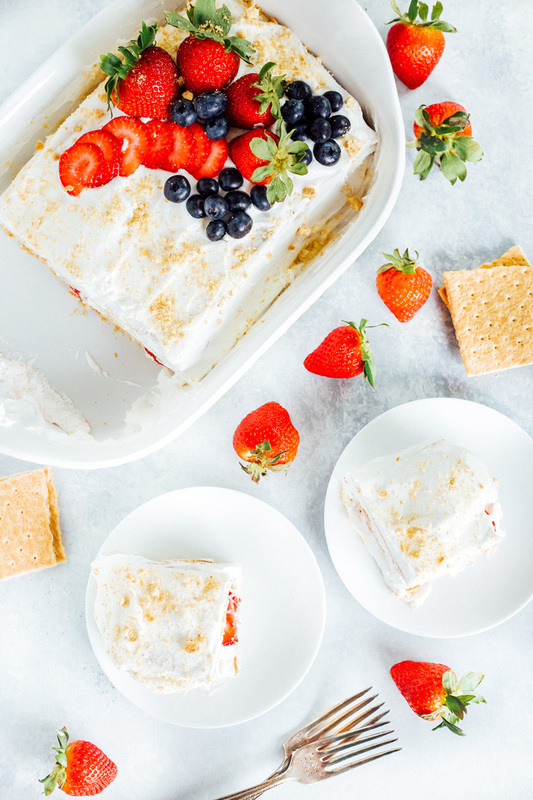 I grew up eating icebox cake when I was younger. There are many different variations to it but the one I was most use to was chocolate pudding and graham crackers….um hello…yummers! I put that recipe in my cookbook that’s coming out this fall, Yay! 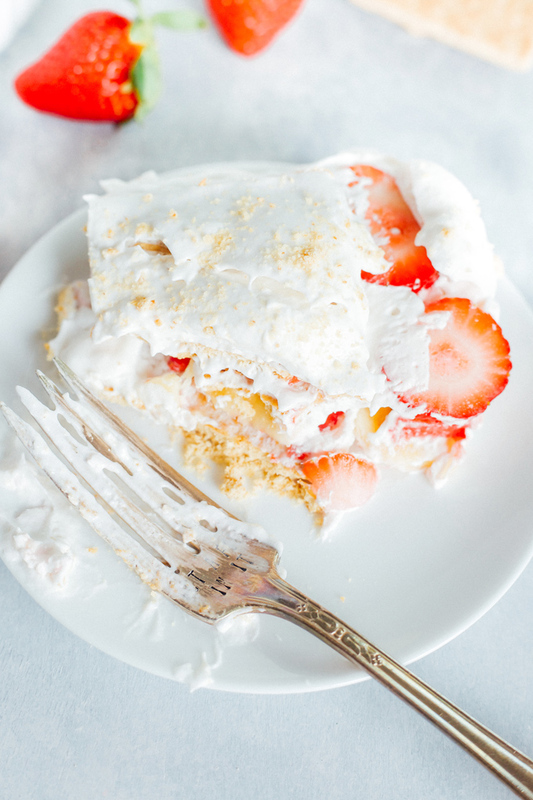 But anywho, you can make icebox cake so many ways with whatever combinations you’d like. It’s my go to, last minute throw together when I need to make something on the fly for BBQ’s or any party of sorts. There is no one size for icebox cake. You can make it however big or small as you’d like. Small party? No problem, just make a small icebox cake. Big party with lots of mouths to feed? No problem, just make a bigger icebox cake. And this one, filled to the brim with fresh strawberries and bananas and coconut cream is a sure hit out of the park (baseball reference). 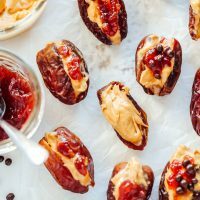 I know it looks super fancy but the ingredients are insane and you most likely have them on you already. You can make this Vegan Strawberry Banana version same day or the night before. I prefer to make it a day ahead (if I have the time) so it can sit and the graham crackers get absorbed by the coconut cream. They become super soft and it’s utterly fantastic. When purchasing the graham crackers just make sure they’re vegan because the most popular options are with honey. Trader Joe’s, WholeFoods, and Shoprite all have vegan options and to be honest they taste exactly the same, I wouldn’t really know the difference. Another option you have is you can buy the coconut cream already made or make it yourself. To save myself some time I like the dairy free coco whip by So Delicious. It legit tastes like cool whip except it’s completely vegan. They have a full fat one or a lite version and I always go with the full fat one that’s in the blue container. 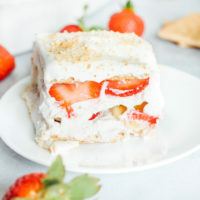 In this Vegan Strawberry Banana Icebox Cake I maxed it out at 4 layers. Feel free to do however many layers you like but I think 4 is a good, standard size, depending on what dish you’re using. You start by placing down graham cracker sheets to cover the bottom of the dish. You top that with a generous amount of coconut whip and top the coconut whip with sliced strawberries and bananas. Repeat this process until you reach the top of your dish. Once you reach the top you can place extra berries and crushed graham crackers as a delectable garnish. Even if you wanted to do a chocolate drizzle no one will be stopping you (especially not this gal. *points finger at myself, lol). I love the combo of strawberries and bananas but you can do blueberries, raspberries, chocolate chips, vegan vanilla pudding, chocolate pudding, or anything! Just let your tastebuds guide you. This is one of my fave spring/summer desserts. It’s easy, super tasty, refreshing, somewhat on the healthier side, and need I say it? Ultra impressive. Mother’s Day is approaching so perhaps whipping this together for Mom or for a gathering would be perf. Even my Vegan Lemon Cream Layer Cake would be bomb dot com. I hope you guys enjoy this as much as I do! 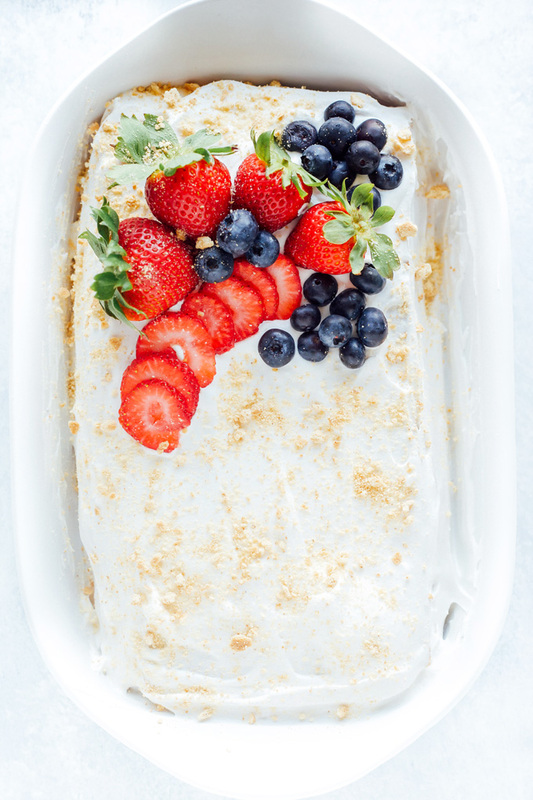 Have you ever heard of icebox cake? What are some of your variations for it? 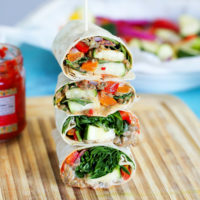 Do you have a go to combo that is a family fave? I would love to try it! 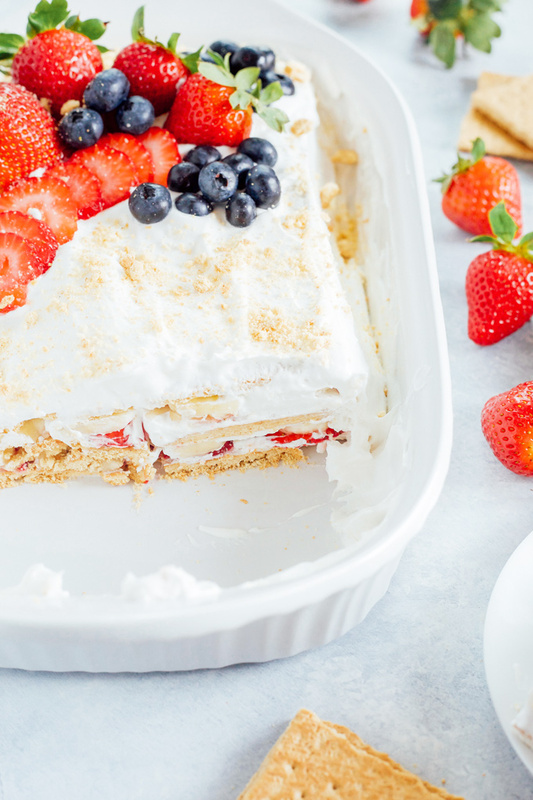 Generously filled with coconut whip cream, fresh strawberries and bananas, this delightful dessert is easy, super tasty, refreshing, and on the healthier side! For what you see pictured I used a 9x13" baking dish but you can use an 8x8", 9x9", etc. Start by covering the bottom of the dish with graham cracker squares. 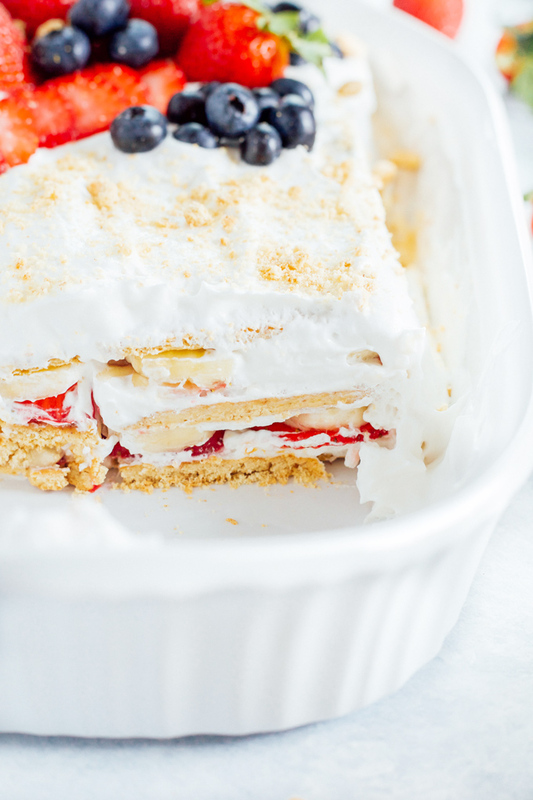 Top and spread across with a generous amount of coconut whip cream, then strawberry and banana slices. Repeat this process until you reach the top then garnish with extra berries and crushed graham crackers if desired. Serve immediately or let sit in the fridge over night. Enjoy! Can sub any fruit or vegan chocolate or vanilla pudding. 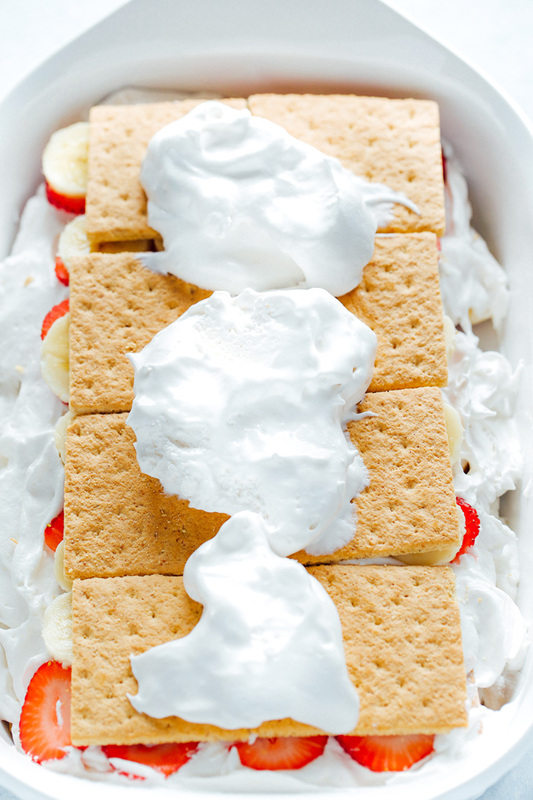 Can use any baking dish size, adjust graham crackers, fruit amount, and coconut whip. Can be eaten right away or preferably left in the fridge overnight to set. Make sure to use vegan graham crackers. NeuroticMommy is a participant in the Amazon Services LLC Associates Program, an affiliate advertising program. This means that if you click and make a purchase, NeuroticMommy makes a small commission, at not cost to you. I truly appreciate your support in this way as it helps keep NM up and running. All the Positive Vibes!